Known in Spanish as ‘El Día de los Muertos‘, this unofficial but widely observed holiday is celebrated on 2 November each year. 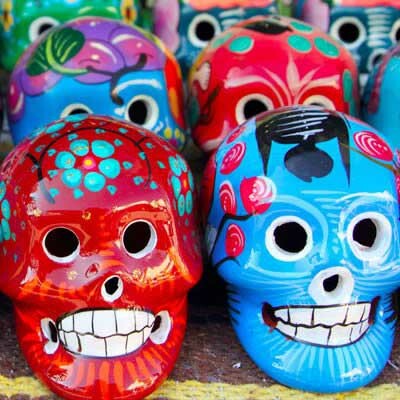 Every year, on 1 November (All Saints Day) and 2 November (All Souls Day), something unique takes place in many areas of Mexico: Day of the Dead festivities. While it’s strange for most of us to accept the fact that “death” and “festivities” can go hand-in-hand, for most Mexicans, the two are intricately entwined. This all stems from the ancient indigenous peoples of Mexico (Purepecha, Nahua, Totonac and Otomí) who believed that the souls of the dead return each year to visit with their living relatives – to eat, drink and be merry. Just like they did when they were living.